I didn’t know what to expect in Next, today’s much-anticipated No Man’s Sky update. Past updates have added or overhauled features, but the game still felt familiar. Not so with this one. 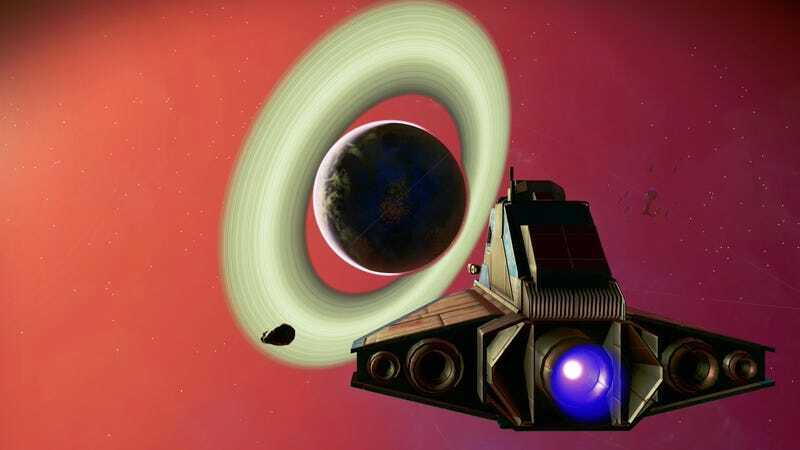 Next brings true multiplayer to No Man’s Sky, but it also brings a huge graphical overhaul, unlimited base building, character customization and a third person mode, as well as several small but welcome quality of life improvements. It feels like everything has changed for the better. Crafting is simplified, inventory management is much easier, exploring the galaxy is full of new delights. I liked the game at launch, but I considered it an acquired taste. Now I can’t imagine anyone not loving it. Even if you’ve been playing this entire time, every new moment in this update feels like a new discovery. Adjusting to the new recipes for things like warp cells and fuel can take a moment, but I got the hang of it quickly. I sold off my outdated technology to buy a new ship, which I didn’t need, but I wanted something new to see the overhauled planets for the first time. It was worth it. I didn’t realize how much of a difference clouds would make, but entering into a new planet by coming through a cloud barrier enhances the anticipation before you land. And once you get there, there’s just more stuff to do. Maybe I’ve just been lucky, but every time I’ve landed so far, even on nuclear planets, there were plenty of weird rocks, aliens and plants to scan. As always, these planets are beautiful, but the graphical overhaul has made the terrain feel less craggy and random. I’m still sad that I had to leave the one tropical planet I found with Earth-like grass and trees, but the boiling rain really made it hard to stay. Some of the new recipes for crafting now include an additional step in which you have to refine some minerals in order to use them. Rather than being tedious, this opened me up for more exploration. I wasn’t just looking for the one mineral I needed and then hopping in my ship—I also had to find what I needed to craft a refiner, then go find some fuel for it, then find the mineral I needed, and then refine it. It’s so easy to get lost in this scavenging now, which is impressive because I found it pretty easy to get lost in No Man’s Sky to begin with. What especially made all the new features shine was when Kotaku video producer Paul Tamayo dropped into my planet for a visit. It was incredibly easy—he just friended me on PlayStation and selected to join my game from the start menu. I heard him in my headset immediately, turned around, and he was there. It was so simple and so magical to hear him react to the toxic planet I had found myself on. As a boiling monsoon raged at us, we strategized about where to head next, where to find the minerals we needed, and just marveled at the beauty of space. The refiner also makes a really satisfying gurgling noise. While exploring with Paul, we got into a dogfight with some NPCs. He had a more maneuverable ship and was able to pick them off handily. Once we got the signal that all the pirates were gone, I noticed I was still being shot at. I dodged and weaved to get out of the line of fire. The attacker definitely wasn’t one of the pirates from before, and Paul and I wondered if maybe it was another player. By the time we shot them down, we still hadn’t been able to figure it out. We still don’t know. It feels incredible to have that little unsolved mystery. I have already played dozens of hours of No Man’s Sky. I actually hadn’t picked it up in a while, in favor of other newer games. After spending a few hours in it today, I can already see this game devouring my life again. Apologies to anyone that I’ve made plans with. You can meet me in the stars.